What Do I Have to Prove to Win a Case of My Child Being Injured on a Trampoline? Sometimes the manufacturer of the trampoline can be held liable for negligent design or manufacture. Or if your child was injured on a neighbor's or friend's trampoline, they might be held liable for negligently causing your child's trampoline injury either through improper maintenance of the trampoline or improper supervision. As Syracuse trampoline injury lawyers, we can quickly review the facts of your case to determine whether a trampoline injury case is viable. First, a little background about trampoline injuries. There are about one million of them across the United States. They are a popular home outdoor toy, but compared to other toys, a swing set for example, they are far more dangerous. The number trampoline injuries has been on the rise so that there are now approximately100,000 emergency room visits per year related to trampolines. Most injuries involve children, although adults do use and are sometimes hurt by trampolines. Our trampoline injury attorneys estimate that about half the trampoline injuries in the Syracuse area are NOT caused by the negligence of anyone. Instead, they are caused by the inherent risks in trampoline use. 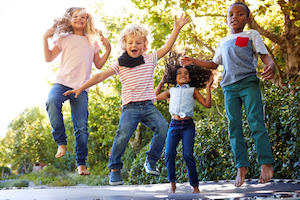 Generally, if a child is using a trampoline with the permission of his or her parent, it is understood that the child and the parent are assuming the usually risks associated with trampoline use. And of course there are risks in jumping high in the air on a bouncy rubber-like stretched fabric. If your child lands just a bit "wrong", it can cause injury. If your child is injured because of the normal risks of trampoline use that he or she and you assumed, then there is no case to bring against anyone. protective devices either missing or removed by owner. As for the first bullet-point above, the claim would be against the trampoline manufacture and the store that sold it. Nowadays, though, defective design/manufacture claims are rare. Trampoline manufactures have learned from their mistakes and now generally make them as safe as possible. Was there adult supervision, and if so, was it adequate? Was only one person allowed one on the trampoline at a time? Was the child instructed properly on how to use the trampoline? For example, he should be told to jump ONLY in the MIDDLE of the trampoline. What was your child doing when she was injured? A flip, for example? Proper trampoline use involves jumping only, and flips, somersaults and splits and not properly permitted. Did the supervising adult allow such improper use? What was the age of the child? A child under six should never be allowed to use a trampoline, and the level of supervision must be more strict the younger the child. Was the trampoline and surrounding equipment properly installed and maintained? For example, there should be a fence around the trampoline to prevent children from getting on the trampoline without adult permission? Was there some defect that caused the injury and was due to improper maintenance, for example, a corroded or missing part? What kind of injuries do trampoline users suffer? Primarily fractured bones (almost 50%), but a significant percentage of these (12%) involve the spinal cord, which can produce life-long debilitating injuries, including the dreaded quadriplegia or paraplegia. Also, head traumas are not uncommon. Should you be worried about bringing a claim against a neighbor or friend who owns a trampoline? Not really. They likely have homeowner's insurance that will cover all of the legal costs of defending the case as well as the settlement or judgment. And we allow our Syracuse area clients to decide whether to limit their economic recovery to insurance moneys or to claim personal assets as well. It costs you nothing to get a consultation with us regarding yours or your child's trampoline injury, so don't hesitate to contact our Syracuse trampoline injury attorneys. What are the Most Common Causes of Syracuse Playground Accidents & Injuries and How Do We Prove Our Case? How Can I Prevent My Child from Suffering a Playground Injury?